The latest craze in the world of ridiculous Twitch streams? Fish. We’ve already seen one goldfish play Pokémon, but how about some local, bowl-based multiplayer? 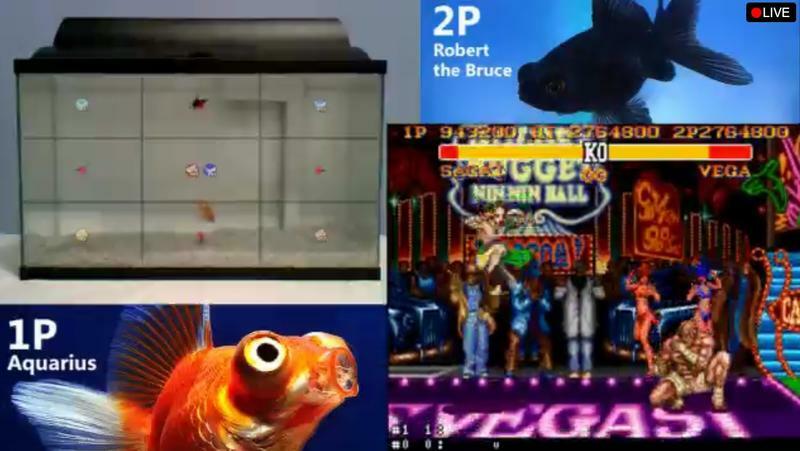 Welcome to FishPlayStreetFighter playing Super Street Fighter II Turbo. Robert the Bruce tangles with Aquarius in a constant battle for supremacy in one of the greatest fighting games ever made. Each fish is recognized by a camera. Their movements are translated to in game moves based on which section of the tank they swim two. Their human owner has subjected them to this endless hours now, so I imagine they’re super tired. Alright, Twitch fans. What do you want to see next? How about a hamster playing Minecraft? Oh, speaking of Twitch, TechnoBuffalo now has a channel. We stream daily. Come hang out.